(7) The British government admits that – between 1946 and 1948 – it bombed 5 ships carrying Jews attempting to flee the Holocaust to seek safety in Palestine, set up a fake group called “Defenders of Arab Palestine”, and then had the psuedo-group falsely claim responsibility for the bombings (and see this, this and this). (28) A Rwandan government inquiry admitted that the 1994 shootdown and murder of the Rwandan president, who was from the Hutu tribe – a murder blamed by the Hutus on the rival Tutsi tribe, and which led to the massacre of more than 800,000 Tutsis by Hutus – was committed by Hutu soldiers and falsely blamed on the Tutis. (29) An Indonesian government fact-finding team investigated violent riots which occurred in 1998, and determined that “elements of the military had been involved in the riots, some of which were deliberately provoked”. (30) Senior Russian Senior military and intelligence officers admit that the KGB blew up Russian apartment buildings in 1999 and falsely blamed it on Chechens, in order to justify an invasion of Chechnya (and see this report and this discussion). (31) As reported by the New York Times, BBC and Associated Press, Macedonian officials admit that in 2001, the government murdered 7 innocent immigrants in cold blood and pretended that they were Al Qaeda soldiers attempting to assassinate Macedonian police, in order to join the “war on terror”. luring foreign migrants into the country, executing them in a staged gun battle, and then claiming they were a unit backed by Al Qaeda intent on attacking Western embassies”. Macedonian authorities had lured the immigrants into the country, and then – after killing them – posed the victims with planted evidence – “bags of uniforms and semiautomatic weapons at their side” – to show Western diplomats. (32) At the July 2001 G8 Summit in Genoa, Italy, black-clad thugs were videotaped getting out of police cars, and were seen by an Italian MP carrying “iron bars inside the police station”. Subsequently, senior police officials in Genoa subsequently admitted that police planted two Molotov cocktails and faked the stabbing of a police officer at the G8 Summit, in order to justify a violent crackdown against protesters. (33) The U.S. falsely blamed Iraq for playing a role in the 9/11 attacks – as shown by a memo from the defense secretary – as one of the main justifications for launching the Iraq war. 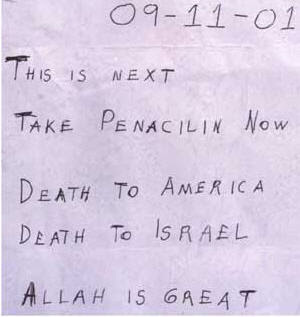 (34) Although the FBI now admits that the 2001 anthrax attacks were carried out by one or more U.S. government scientists, a senior FBI official says that the FBI was actually told to blame the Anthrax attacks on Al Qaeda by White House officials (remember what the anthrax letters looked like). Government officials also confirm that the white House tried to link the anthrax to Iraq as a justification for regime change in that country. And see this. (41) In 2005, British soldiers dressed as Arabs were caught by Iraqi police after a shootout against the police. The soldiers apparently possessed explosives, and were accused of attempting to set off bombs. While none of the soldiers admitted that they were carrying out attacks, British soldiers and a column of British tanks stormed the jail they were held in, broke down a wall of the jail, and busted them out. The extreme measures used to free the soldiers – rather than have them face questions and potentially stand trial – could be considered an admission. (42) Undercover Israeli soldiers admitted in 2005 to throwing stones at other Israeli soldiers so they could blame it on Palestinians, as an excuse to crack down on peaceful protests by the Palestinians. (43) Quebec police admitted that, in 2007, thugs carrying rocks to a peaceful protest were actually undercover Quebec police officers (and see this). (46) An undercover officer admitted that he infiltrated environmental, leftwing and anti-fascist groups in 22 countries. Germany’s federal police chief admitted that – while the undercover officer worked for the German police – he acted illegally during a G8 protest in Germany in 2007 and committed arson by setting fire during a subsequent demonstration in Berlin. The undercover officer spent many years living with violent “Black Bloc” anarchists. (47) Denver police admitted that uniformed officers deployed in 2008 to an area where alleged “anarchists” had planned to wreak havoc outside the Democratic National Convention ended up getting into a melee with two undercover policemen. The uniformed officers didn’t know the undercover officers were cops. (48) At the G20 protests in London in 2009, a British member of parliament saw plain clothes police officers attempting to incite the crowd to violence. (49) The oversight agency for the Royal Canadian Mounted Police admitted that – at the G20 protests in Toronto in 2010 – undercover police officers were arrested with a group of protesters. Videos and photos (see this and this, for example) show that violent protesters wore very similar boots and other gear as the police, and carried police batons. The Globe and Mail reports that the undercover officers planned the targets for violent attack, and the police failed to stop the attacks. (50) Egyptian politicians admitted (and see this) that government employees looted priceless museum artifacts 2011 to try to discredit the protesters. (51) Austin police admit that 3 officers infiltrated the Occupy protests in that city. Prosecutors admit that one of the undercover officers purchased and constructed illegal “lock boxes” which ended up getting many protesters arrested. (52) In 2011, a Colombian colonel admitted that he and his soldiers had lured 57 innocent civilians and killed them – after dressing many of them in uniforms – as part of a scheme to claim that Columbia was eradicating left-wing terrorists. And see this. (53) Rioters who discredited the peaceful protests against the swearing in of the Mexican president in 2012 admitted that they were paid 300 pesos each to destroy everything in their path. According to Wikipedia, photos also show the vandals waiting in groups behind police lines prior to the violence. (54) A Colombian army colonel has admitted that his unit murdered 57 civilians, then dressed them in uniforms and claimed they were rebels killed in combat. (55) On November 20, 2014, Mexican agent provocateurs were transported by army vehicles to participate in the 2014 Iguala mass kidnapping protests, as was shown by videos and pictures distributed via social networks. (56) The highly-respected writer for the Telegraph Ambrose Evans-Pritchard says that the head of Saudi intelligence – Prince Bandar – recently admitted that the Saudi government controls “Chechen” terrorists. (57) Two members of the Turkish parliament, high-level American sources and others admitted that the Turkish government – a NATO country – carried out the chemical weapons attacks in Syria and falsely blamed them on the Syrian government; and high-ranking Turkish government admitted on tape plans to carry out attacks and blame it on the Syrian government. (58) The Ukrainian security chief admits that the sniper attacks which started the Ukrainian coup were carried out in order to frame others. Ukrainian officials admit that the Ukrainian snipers fired on both sides, to create maximum chaos. (59) Burmese government officials admitted that Burma (renamed Myanmar) used false flag attacks against Muslim and Buddhist groups within the country to stir up hatred between the two groups, to prevent democracy from spreading. (60) Israeli police were again filmed in 2015 dressing up as Arabs and throwing stones, then turning over Palestinian protesters to Israeli soldiers. (61) Britain’s spy agency has admitted (and see this) that it carries out “digital false flag” attacks on targets, framing people by writing offensive or unlawful material … and blaming it on the target.